From the SWEAT app options menu, clients have direct access to a variety of useful account tools and settings. For a detailed description of each option, see the table labelled Options below. Open the SWEAT app and login. Tap your user icon in the top-right corner. Your options menu is displayed. My Activity From here, you can view all of your recent activity on WellnessLiving, including booked services, attended services, and earned reward points. Check this option regularly if you opt out of notification emails and alerts, but still wish to stay up-to-date with your activity. Alerts When you have unread notifications in the SWEAT app, the number of messages will be displayed next to the Alerts option. Tap this option to review your alerts. Profile Details From here, your profile details can be viewed or changed. These changes will apply to your account automatically and across the system. 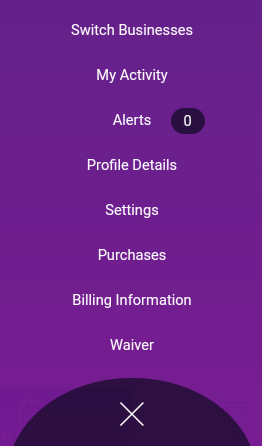 Settings From here, you can contact support, view information about your app, change your notification, and connect your social media accounts. Purchases From here, your purchases with the selected business can be viewed, searched, and filtered to find any purchase information you require. For more details, you may email a receipt for any purchase directly to yourself from here. Billing Information From here, you can view or edit all of your individual billing information including account balance, account history, saved credit cards, and saved ACH accounts. You can also redeem any Gift Card or Deal Redemption Codes by simply entering the code in the labeled box. Waiver From here, you can view any waivers you have signed with the selected business, along with the date the waiver was signed and an image of the signature.